We all know that Jasmine liked to break the mold. An age old tradition of marrying for the good of the country is thrown out the window so that she can marry her true love. But I have to question why she falls in love with Aladdin. Sure, they both feel trapped in their current life situations and he saves her from getting her hand cut off, but is that the foundation of a long lasting romance? Eh…maybe. You can play the ‘they are meant to be’ card but that is the easy way out. I think one of the reasons Jasmine loves Aladdin has more to do with his station in life that she realizes. 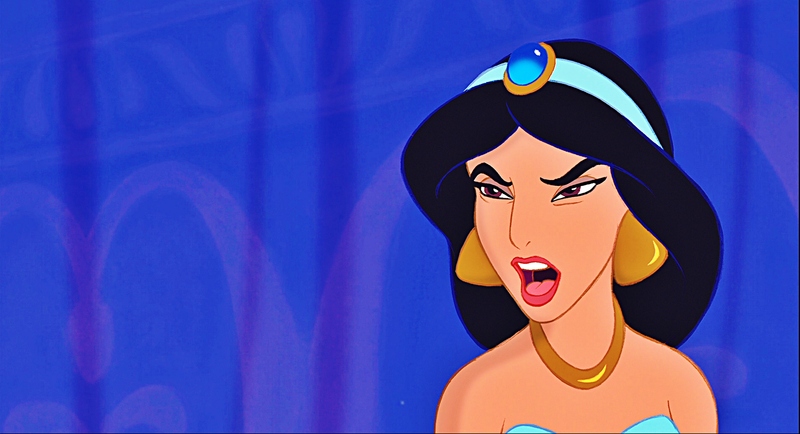 Let’s look at the way Jasmine responds to authority. First, she consistently goes against her father’s wishes. I know he doesn’t seem to make the best choices, but I don’t remember her doing what he says once in the movie. Whether we think they are wrong or not, she does everything in her power to screw up the various courtships arranged by her dad and even chooses to run away instead of trying to make it work. I know it’s difficult, but look at it from the implications to the kingdom, not from the lens of America today. Her choices affect way more than just herself. And then there is Aladdin. When he is a street rat, she falls for him immediately but the minute he shows up as a Prince she won’t give him the time of day. Sure he is being a bit arrogant, but is it that or is his title getting in the way? I mean, she won’t even have a conversation with him until he offers, ‘You’re right.’ ceding the floor to her. Could it be that Jasmine chooses Aladdin as a way to both assert her independence from her father, as well as, create a situation in which she would be the one who would forever be in position of authority in the relationship? Could it be that she didn’t finish her thought when she was talking to her dad in the opening palace scene of the film? Instead of just saying ‘Well, then maybe I don’t want to be a princess…’ maybe she wanted to also add…’maybe I want to be Sultan!’ That truly would have been a whole new world. This entry was posted on March 23, 2018 by Jesse. It was filed under Disney .